• Wednesday 13th March – just a day, not a month - but start as you mean to go on! Every journey begins with one small step and so for those hoping to call it quits, National No Smoking Day offers a great opportunity to kick the habit to the kerb. This year, National No Smoking Day falls slap bang in the middle of the week – Wednesday 13th March – so some extra determination may be needed by those wishing to call a halt to the habit on ‘hump day’. Unlike Stoptober, the month-long October campaign, National No Smoking Day is a one-day wonder, so the emphasis has to be on making the most of it and arming yourself with everything you need to succeed. The good news is that quitting will soon produce all kinds of benefits – for your health and your appearance too. Staying off cigarettes and using White Glo Smoker’s Toothpaste for just twenty-eight days will help you refresh your mouth by getting rid of the tobacco stains and smokers’ breath. The yellowish hue often associated with frequent smokers can be radically reduced within weeks, meaning a glowing smile can be an easy win for those seeking to quit. White Glo’s Smokers Formula is the ideal product for quitters. It helps remove tobacco stains and reduce smokers’ breath. Its effective whitening formula is a low-abrasion product and is safe for daily use, helping to whiten teeth in as little as twenty-eight days, and is backed by a 100% money-back guarantee. Find out more about looking after your teeth at www.whiteglo.com and why not try these tips to help you quit! For additional comment and for further images to accompany this release please contact Amy on amy@kincomms.com or 020 3958 7085. Samples are available for press, these include: White Glo Pure and Natural, Professional Choice, Smokers Formula, Charcoal Deep Stain Remover, Diamond Series, Coffee and Tea Remover Formula. 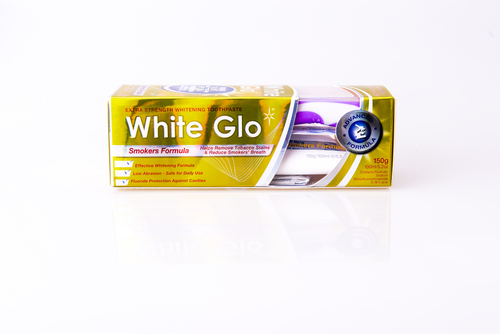 White Glo Smokers Formula is a premium fluoride-enriched toothpaste with Diatomaceous Earth, specially formulated to remove tobacco stains and help eliminate smoker’s breath. It contains Micro Polishing Particles to remove discolourations and yellowing on tooth enamel caused by cigarette smoking as well as food and drinks with strong colouring. The toothpaste contains essential fluoride protection against cavities and is designed to be low abrasion for protection of the enamel of the teeth, making it perfect for safe daily use. Each pack comes with a free whitening toothbrush and dental flosser. Canstar Blue is Australia’s leading consumer review and comparison website. Its unbiased results and ratings across 100+ categories each year help Aussie consumers make better-informed purchase decisions. Its 2019 Toothpaste Review involved more than 2,000 adults rating toothpaste brands including Colgate, Oral-B, Macleans and Sensodyne and more on several key factors.